In 1980 I traveled down Highway 54 in Missouri. Wild purple coneflowers lined the roadside in waves of pink flowers that resembled shooting stars headed for the heavens. The long pink petals fell back from the orange seed head in wavy rays. The beautiful flowers seemed to float above the tall roadside grass. At the time I wondered why it was call purple rather than pink coneflower, but that’s just one of its mysteries. Ten years later they were gone. 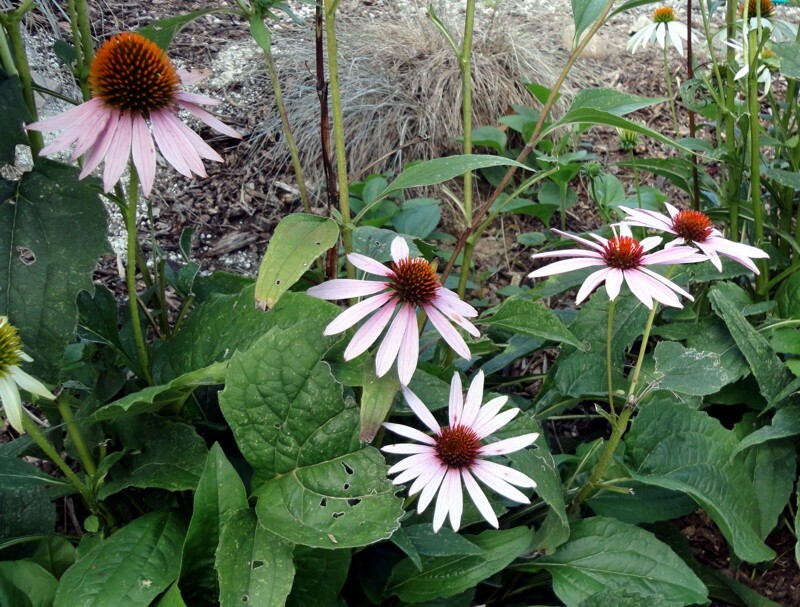 The coneflower, or Echinacea, had become a ‘cure’ for weak immune systems and AIDS had become a prevalent disease. Coneflowers roots became a valuable commodity. A friend told me it took one year to empty the roadside of coneflowers. Diggers waited until the plants bloomed, then dug them wherever they spotted the flowers, filling trucks with plants taken from public property. At that time Missouri had no law against digging roadside wildflowers. Coneflowers are vestige plants of the prairies that once stretched across America. They have a long history as medical plants. Native Americans used the roots of this wildflower for everything from snakebite to cleansing rites for ceremonial rituals. European settlers soon used the coneflower as a blood purifier to cure a wide variety of ailments such as unidentified infections and ailments. As garden plants, the mid-to-late summer flowers of Purple Coneflower punctuate the border with large, vivid blossoms on three-foot stems. The orange cones contrast with the pink petals in an unusual color harmony among flowers. As prairie plants, coneflowers thrive where many plants fail. Coneflowers grow from zone 4 to zone 8 with equal ease. They withstand drought, love hot sunny sites, and don’t need regular applications of fertilizer. They are easily grown from seed, but the plants take two years to reach flowering size. Most garden centers carry pot-grown plants, usually already in flower. Transplanting doesn’t seem to bother them anymore than the type of soil in which they are planted. Known as ‘clay busters,’ coneflowers grow in clay as well as sandy soils like mine. The foliage has never been as attractive as the flowers. The large leaves have serrated edges and are coated with fine hairs. They look coarse and can be attacked by mildew making them even more unattractive. If mildew is a problem in your area, try growing some of the mildew resistant cultivars available. This is a great plant for any garden and although blooms throughout the summer sparkles especially in late summer and fall.